One of the rare times I bought something at an antique mall, because normally they seem to think everything is made of solid gold and they'll price something at $50 that normally sells on eBay for $8, and they'll put it on a shelf and they don't care if it sits there for five years without selling. I don't understand that at all. But this was one marked $4, and even though it's virtually worthless, I've never seen one before and the price was right. I assume that this turkey is the sort of thing that was included in a kit when you bought a really low-end 8mm camera back in the early 60s. I assume most of them were chucked immediately into the garbage; it may be the rarest meter I own. 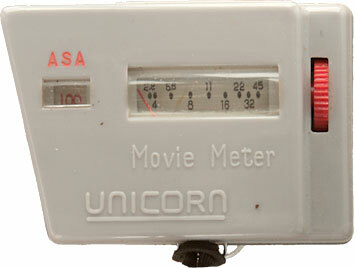 Like other movie meters (e.g. the Walz DR), there's virtually nothing to it except a film-speed setting an a rotating aperture scale, since the shutter speed of around 1/30th is assumed. Capital also sold this under their own name, so I'm not sure who made it and who rebadged it.